The biggest selling record of 1947 is Near You, which owns the #1 spot on the Pop Charts for twelve weeks, from mid-September to early-December. The unlikely artist responsible for the song was Francis Craig who had been primarily a local attraction in his home state of Tennessee for years. Back in college in the twenties he wrote the eventual University Of Tennessee fight song called “Dynamite”, and after dropping out of school to lead his own band he appeared on radio intermittently without ever breaking through on a national basis. By the 1940’s was playing and broadcasting from a hotel, his career winding down into semi-retirement. The recording industry was situated in the big cities, primarily New York, along with Chicago and more recently Los Angeles, but there was no recording opportunities to speak of in Tennessee until independent label Bullet Records came along operating out of Nashville. For the label’s first release, and with limited resources to promote anything far outside their own backyard, they naturally looked to a fairly well-known local institution to get them regional sales if nothing else, and so with Craig on piano and Bob Lamm on vocals they cut Craig’s signature tune “Red Rose” as the A-side, which stirred no interest. The B-side was another song written by Craig, a dreamy ballad called “Near You”, and that soon started getting spins in the south before exploding nationwide, making him one of the most unlikely stars of the decade. “Near You” quickly became one of the defining songs of the pop era, used as comedian Milton Berle’s theme song on television for his entire career, giving it a longer afterlife than it would’ve likely enjoyed otherwise. Though Craig scored one more hit, he was hardly a musical heavyweight with a deep creative well to draw from. His career up to this point had been about what could be expected of someone of his modest talents and he quickly faded from the scene. However the impact of the record went far beyond even its considerable sales as it opened up Nashville as a recording center, first for other pop acts who came to town in hopes of catching the same proverbial lightning in a bottle that Craig had, but then because of the local music tastes which ran towards what was then known as hillbilly, the city became the country-music capital of the world in rather short order. 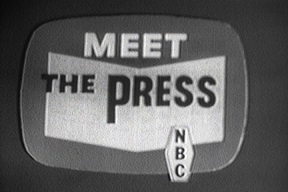 Meet The Press debuts on NBC television at the dawn of the TV era. The show remains on the air in the same format today, making it the longest continuously running program in television history. Middleweight boxing contender Jake LaMotta throws a fight against Billy Fox for mobsters in exchange for their promising him a title bout. LaMotta’s dive was unconvincing as he never hit the canvas but let Fox batter him without cease for two solid minutes in the fourth round before the referee stopped the fight. 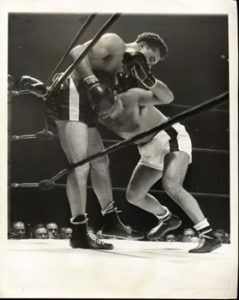 Rumors that the fix was in started spreading even before the match as the odds shifted noticeably in the days leading up to the bout to the point where the far superior LaMotta was a 3 to 1 underdog. The newspapers the next day were already reporting the suspect nature of the result and LaMotta was promptly suspended by The New York State Athletic Commission but did get a title shot two years later. 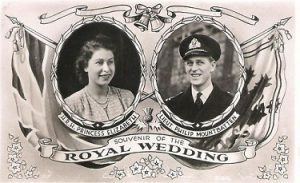 Princess Elizabeth marries Lt. Philip Mountbatten, the Duke of Edinburgh, at Westminster Abbey. Two hundred million people around the world listened on radio as the future Queen Of England was wed. They celebrated their 69th anniversary in 2016 so it appears the union may endure. 25,000 people are reported to have bought television sets this month, a new record for the growing medium as reports show that sales are now doubling each month. Out Of The Past starring Robert Mitchum, Kirk Douglas and Jane Greer debuts in theaters. With its twisted plot, use of flashbacks, moody black and white cinematography, hard-boiled dialogue and a fatalistic story it is considered one of the quintessential film noirs and perhaps the definitive performance of Mitchum’s career. In 1991 Out Of The Past was named to The National Film Registry by The Library Of Congress. 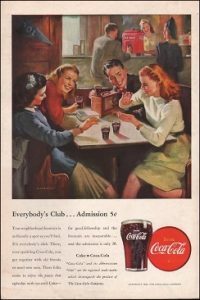 Both a cup of coffee and bottle of Coca-Cola cost a nickel apiece, while a beer was 15 cents. Howard Hughes makes the only flight of his all wooden experimental airplane, The Hughes H-4 Hercules. Designed to transport troops for World War Two it cost 23 million dollars for the five story behemoth and was not completed until two years after the war ended making it one of the most notable aviation “failures” in history. 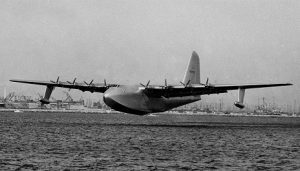 However “The Spruce Goose” as it was derisively nicknamed still holds the record for largest flying boat and the airplane with the largest wingspan, though it was airborne for just one mile.